The rusty patched bumblebee, Bombus affinis, is a keystone species in grasslands and tallgrass prairies in the Upper Midwest and Northeast of the US and is known for their workers and males donning a rusty, reddish patch on their back (U.S. Fish & Wildlife Service [FWS], 2017). Through pollination, this bumblebee species aids in the creation of seeds and fruits that feed other wildlife (FWS, 2017). Without the rusty patched bumble bee, plants such as Dutchman’s breeches could not reproduce efficiently (Macior, 1970), resulting in their decline and the decline of species that depend on those plants for food such as ant species that enjoy the seeds of Dutchman’s breeches (The Pennsylvania State University, 2002). Rusty patched bumblebees were abundant 20 years ago, but since then their numbers declined to less than 90% of their original number (Fears, 2017, para. 1; Greshko, 2017, para. 2). Because of its drastic decline, it was deemed endangered by the U.S. Fish and Wildlife Service (FWS, 2017; Fears, 2017; Greshko, 2017). The decline of the rusty patched bumblebee is due to habitat loss where most grasslands and prairies were degraded or converted for human use such as cities, farms, or roads. Bumblebees need their habitat to provide proper nectar, pollen, nesting sites, and overwintering sites for hibernating queens (FWS, 2017). Other significant factors of bee decline include pesticides, pathogens, and climate change. When people think of bees, they most often think of the iconic honeybee seen on the front of the Cheerios box and think that all bees make honey and virtually perform the same role, but this is not true. While commercial honeybee colonies provide for the majority of agricultural pollination, wild bees are key pollinators that facilitate both wild and commercial plant reproduction and help maintain biodiversity (Pfiffner & Müller, 2016). Bumblebees in particular are one of the most important pollinators because of their ability to “buzz pollinate,” in which the bee grabs the pollen-producing part of the flower and vibrates its wings to dislodge the pollen (Xerces Society of Invertebrate Conservation, n.d.). It can be argued that farmland is more important than bumblebees since farms provide food for the human population. However, rusty patched bumblebees are crucial pollinators of crops such as blueberries, cranberries, clover, and are almost the only insect pollinators of tomatoes (FWS, 2017). So without these bees, our food and fiber goods will disappear and other life will decline (Edward, Moffit, Brown, 2015). For example, almond trees are pollinated by bees, so when bees disappear no almonds will grow and with no almonds, feed for cattle and chickens that people consume will have less feed if the disappearance of bumblebees continues. Our only choice for food would be cut down to corn, rice, and wheat, which are pollinated by the wind. Cotton is also affected by loss of bee pollination which creates products such as clothes and paper (Edward et al., 2015).Without these bees, pollination by hand would cost an extra $3 billion per year in the United States (FWS, 2017, “Why conserve rusty patched bumblebees?”). Incidentally, one of the main reasons why rusty patched bumblebee populations are declining is the lack of grasslands and tallgrass prairies, therefore land should be reserved for these habitats to help rusty patched bumblebee populations. The proper habitats provide appropriate amount of floral resources for the bees to survive. The floral resources will also lessen the impact of other declining factors including pathogens and pesticides. Wild bees in general are very sensitive to changes in landscapes and habitats because bees usually depend on a single plant genus or family, thus the amount of these certain flowers available to bees significantly affects bee populations. Bees depend on rich floral habitats for food and nesting sites (Pfiffner & Müller, 2016). Koh et. al (2016, p. 141) found that between 2008 to 2013 wild bee abundance across the United States decreased as much as 23%. Survival rates for bumblebees in particular are lower when flower coverage on a piece of land are lower (Smart, Pettis, Euliss, & Spivak, 2016). When flower coverage is lower, the bumblebees must travel farther to find enough food, and this increase in distance between nesting site and food source greatly reduces the number of eggs supported by almost 25% and the number of viable offsprings by more than 70% (Pfiffner & Müller, 2016, p. 3). Also, when flower cover is limited and broken up such as in urban areas, it limits the gene pool flow of bumblebees by limiting their ability to move farther from the nesting site (Jha & Kremen, 2013). Thus, bumblebee survival and reproduction are dependant on how much floral resources are available to them. Multiple factors that work synergistically to inflict stress on bumblebee populations include habitat loss, pathogens, and pesticides (FWS, 2016). For example, it is known that pathogens such as Nosema bombi, a fungal pathogen, greatly contribute to the decline of bumblebee populations (Malfi & Roulston, 2014; Cameron et al., 2010). Fortunately, food availability can help bumblebees counter the other factors of decline. For instance, food availability from floral resources can determine how well bumblebees fend off pathogens. It was shown that Crithidia, a parasite, infected bumblebees are at a 40% loss after 7 days when they had less food compared to a 20% loss after 7 days when they had access to more food (Conroy et al, 2016, p. 1215). Therefore, if bumblebees had the proper amount of floral resources, it would provide enough food for general survival and reproduction and significantly lessen the impact of pathogens on bee populations. Pesticides are also one of the main influences on the decline of bumblebee populations. 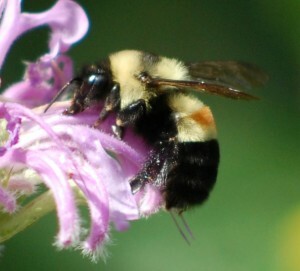 Pesticides are used in agricultural, urban, and natural areas where native bumblebees can come into contact with the chemicals. Neonicotinoids are an insecticide that are especially linked to the decline of this bumblebee since when neonicotinoids were introduced bumblebee decline began. Herbicides can also hurt bumblebees because they can reduce or eliminate flowers that bumblebees need for pollen and nectar (FWS, 2017). Similar to pathogens, bees with enough food available to sustain a complex diet are able to fend off pesticides better (Grozinger et al., 2014). For this reason, the protected lands provided to the rusty patched bumblebees could help bees combat pesticide usage by providing enough food and available habitat. Food availability comes from the bee’s habitat, which is declining rapidly. This habitat loss comes from the ongoing conversion of essential flower-rich lands into farmlands and cities (Goulson, Nicholls, Botías, & Rothray. 2015). Roads and buildings break up habitats into smaller patches that do not provide for these pollinators (Goulson et al., 2015). Unfortunately, the natural habitats that are still around have invasive species that take away crucial and native forages in a habitat that bumblebees rely on such as the Japanese barberry which provide too much shade that kill the Dutchman’s breeches that provide food for the rusty patched bumblebee (Great Pollinator Project, 2014). To combat this problem, more nature reserves should be created and provide large, continuous areas of grasslands and tallgrass prairies with only native wildflowers. The FWS already create and manage National Wildlife Refuges which protects habitat for the conservation and restoration of wildlife and plant resources (FWS, 2015). FWS created such habitats for specific threatened species such as the Bitter Creek National Wildlife Refuge which was created to help and protect the critically endangered California condors. Thanks to the recovery program and protected land, the California condor population has increased since the refuge’s conception (FWS, 2013). Therefore, the FWS should create National Wildlife Refuges for the recently endangered rusty patched bumblebees which would protect the habitat and floral resources the bumblebees depend on for survival. Specifically, grasslands and tallgrass prairies in the Upper Midwest and Northeast part of the US which is the natural and preferred home of the rusty patched bumblebees (FWS, 2017). Also, due to the known detrimental effects of pesticides on bumblebees these refuges should be completely pesticide free in the refuge and in the surrounding areas. Local governments can also take part in creating safe havens for wildlife. The City of Lincoln were able to receive funding from the Nebraska Environmental Trust grants and federal funding programs to create the Eastern Saline Wetlands Project. In doing so, they were able to preserve the degrading wetlands that are home to many wildlife species. In particular, when the Salt Creek tiger beetle was deemed endangered the FWS requested and were able to add 138 acres of critical habitats to the project. Today, designated critical habitats for the Salt Creek tiger beetle consists of 1,933 acres (Lincoln Parks & Recreation, n.d.). Local governments that live in the range of rusty patched bumblebee habitats should be encouraged to preserve and protect the habitat for these bees. As with the Salt Creek tiger beetle, those who manage these lands could work closely with the FWS in order to give the endangered bees the proper habitat to flourish. Since farmland takes land away from bees, farms have tried to establish pollinator habitats. These wildflower plantings attract bees to pollinate their crop plants while providing them with their favorite flowers. These landscapes help both the farmers pollinate their crops and provide the resources to increase bee population. However, endeavors such as these could be harmful to wild bee populations if there is exposure to neonicotinoid pesticides in farmland wildflowers habitats (Sidhu & Joshi, 2016) which leads to gene impairment and population decline (Blacquière et. al, 2016, p. 139). Because of this, neonicotinoids should not be used in these farmland wildflower habitats. With proper management from the farms, bees and farmers can share the land and benefit each other. With urbanization becoming a concern for the survival and dispersal of bumblebees, it is suggested that the government regulate urban growth by promoting ecologically oriented growth which would restrict up to 50% of land from being used (Jha & Kremen, 2013). In 2015 under the authority of President Obama, the Strategy was put in order from the USDA . The Strategy consists of three different goals, but within regards to bumblebees, it promotes the reduction of colony loss and promotes the restoration of millions of acres for pollinators with the action of not only the government but also the public. Increasing land for pollinators is inclusive of having Federal buildings create gardens (Holdren, 2015). Any town, with the right motive and tools can create a safe haven for bees. The city of Afton, in Minnesota, is in the process of creating space for the rusty patched bumblebee, regardless of the fact that construction is happening throughout the sewers. A biologist, Christopher Smith, deemed the area suitable for the species to survive after completing a survey and more surveys and studies are currently being held to justify the habitat (Rddad, 2017). Rddad (2017) states that not only is the city suitable, but the rusty patched have also been reported to be seen here. Afton is currently working with FWS to rid of invasive species and is planting seeds for plants that the rusty patched bumblebee pollinate, such as snapdragons. Washington County officials have set up a protection and restoration law which allows for the growth of pollinator habitats on public areas such as roads (Rddad, 2017). With habitat preservation, the rusty patch bumblebee would be able to increase in number and preserve what is left of the species there. In conclusion, the rusty patched bumblebee is in trouble, meaning the future of crop and wild plant production in America could be as well. Habitat loss, pesticides, pathogens, and climate change all contribute to bees decline. In regards to habitat loss, it’s known that bumblebees survive and reproduce better with proper floral resources available. They also fend off other factors of decline such as pathogens and pesticides better with proper nutrition. Therefore, national wildlife refuges should be created in order to help create more available habitat for the rusty patched bumblebee. These refuges should provide the proper habitat and floral resources for the bees to be able to thrive and bounce back in numbers.